This may sound strange to say that a GPS Vehicle Tracker would have a GPS receiver, but you’ll see from an earlier post that that’s a big assumption. After my disaster with the €13 ‘GPS’ Tracker, I thought I’d step up to the next offer from banggood, the €18 TK110 GPS Tracker. Really €5 makes all the difference here. 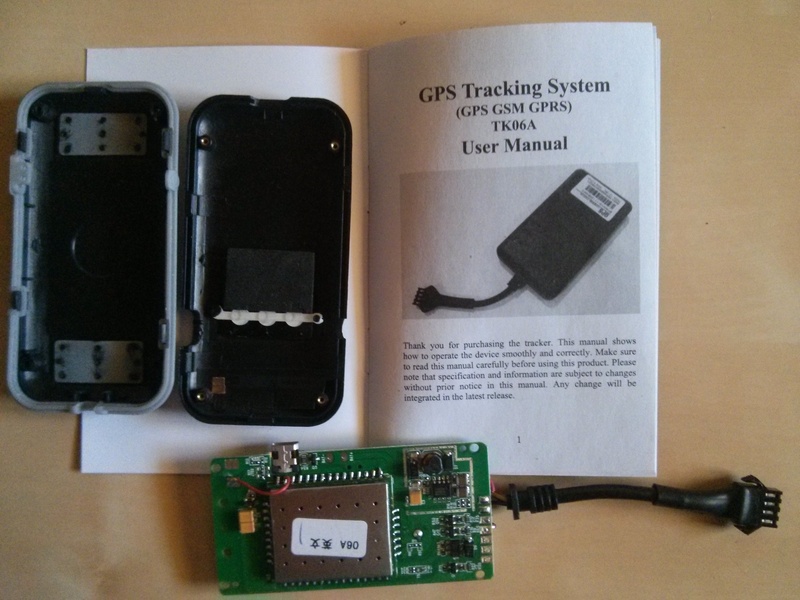 The TK110 tracker came in a white box, no printing. It included a wiring harness, a manual in English (Chinglish), a bit of double-sided sticky foam and the unit itself. The unit wasn’t screwed together, the (ridiculously tiny) screws were in a little bag that I lost almost immediately (found some days later). Unlike some variants of this product, you do need to take the case apart to insert the SIM. As with so many of this kind of product, I can’t be sure of the model number or who made it. The instructions say it’s a TK60A – but the photo in the manual doesn’t match the product itself – but the text does seem to apply. I’ve used a simple, PAYG Lebara SIM in mine. You can perform almost all functions in ‘SMS mode’ without the need to activate GPRS on the device. The unit comes with 1 metre of 4 wire harness. Ground (black), +12V (red), Accessory (i.e. +12V when the key is in your car) and a 12V output signal that you can use to remotely immobilise the vehicle (!). After installing the SIM and screwing the case together (not easy, you have to fight the silicone band into place) I wired this up on the bench with Ground, +12V and Acc. The first thing I noticed that my PC speakers were chattering away with that GSM interference sound that we all know. Clearly RF isolation wasn’t a priority at this price point. Hence the nice little TDK snap-on choke on the wiring harness – that didn’t come in the box, but I couldn’t be doing with the interference. The choke worked pretty well, not 100%, but much better. I placed the device face-up (LED’s pointing towards the sky) and powered-up for a few minutes. Then I gave the device a call. 2 rings and the device hung up. Shortly later I got an SMS message with a Google Maps link to what were some very respectable coordinates. Success! The device was shipped with the case unscrewed, so no warranty to void! The unit appears to be orchestrated with a PIC 12F629. The manual talks about a voice monitor mode whereby you can dial up the unit and listen in to sound (like a one-way mobile). 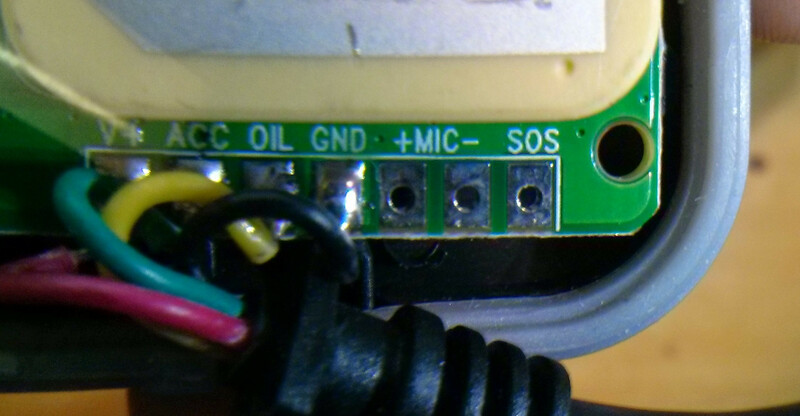 Clearly this isn’t going to work with the unit as-manufactured – the MIC input on the PCB is a no-connect. As is SOS-out. There’s some DC-DC power conditioning going on on the board (Techcode TD1509PR). The GSM antenna connection is a bit how-ya-doin’. That red wire goes to a pad with a springed finger on the other side that touches a foil antenna stuck inside the plastic housing. The manual talks of a feature whereby it will send you an alert if the +12V supply is lost. I don’t know how it’s going to do this since there’s no battery back-up inside the unit. That’s probably the sort of feature you’re really going to want if a professional gang is stealing your Porsche. I couldn’t see the GSM or GPS chipset. 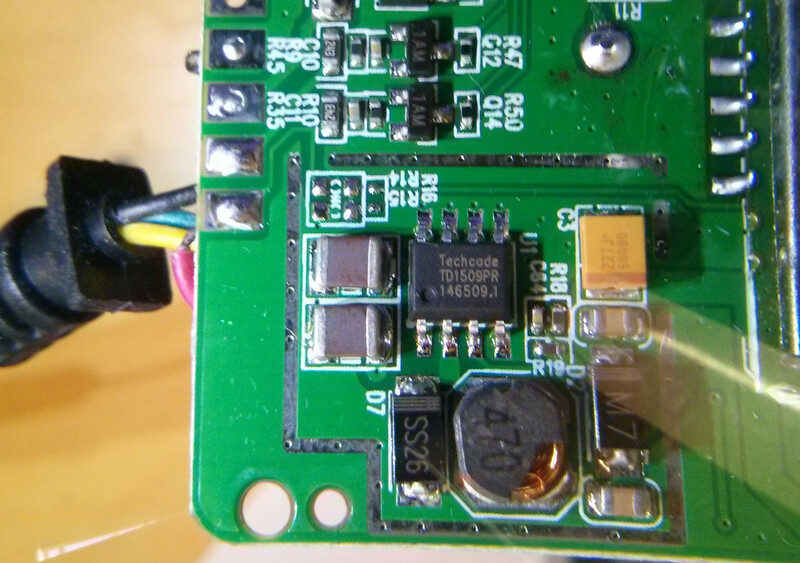 The GSM and / or GPS is hidden inside the can / under the GPS antenna soldered to the board. The manual says UBLOX for the GPS chipset – but the manual is for different hardware (TK60A). If somebody wants to send me €18 I’ll gladly rip the thing apart to tell you. You can hook this up to a relay to cut into, say, the fuel pump electrical supply on your car. You can then send an SMS message to start / stop fuel to the car. Cool! There’s some security, of sorts, where you can specify a single phone number that will be authorised for SMS communication with the device. If you’re going for the remote fuel cutoff, I guess that’s a really Good Thing. I think there’s also a password (fixed, 6 alphanumeric) which might be useful for access / control from various mobile numbers. Various alert triggers to SMS, e.g. Geofence (settable as a radius of n hundred metres from the point when the geofence is set up), Over speed alarm (single speed limit, so not mega-useful), accessory on, etc. It has a mini-USB port. I don’t know what for, but it has one! I tried plugging the USB in when the unit was powered off, and the PC showed nothing. Then I powered the unit up with 12V and I got something, but nothing useful. Usually Ubuntu recognises many things – I was hoping for a mass storage device or a USB-serial converter, but no-dice. The silicone and case has mechanical provision for a switch on the edge of the PCB, but there’s no switch! 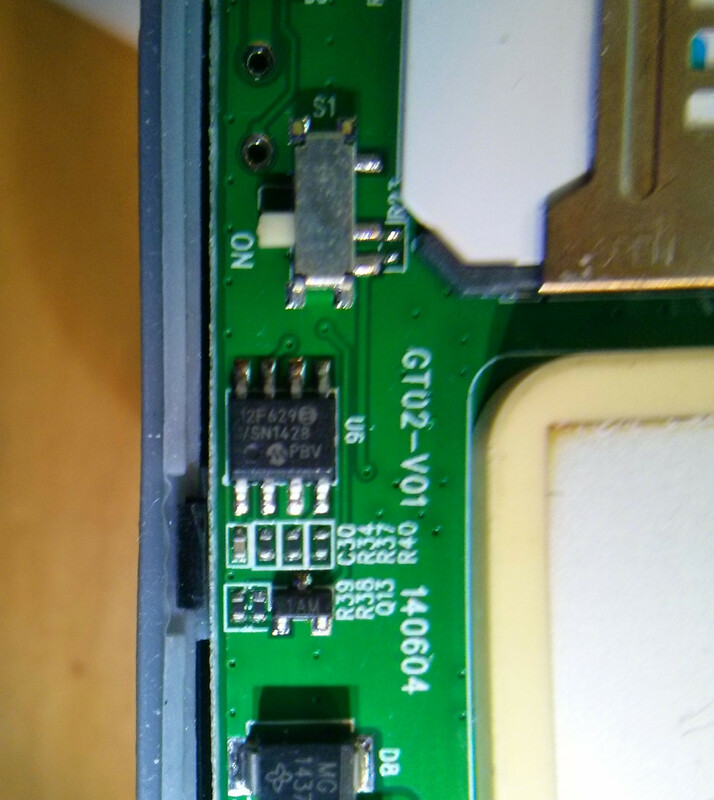 There is a switch on the PCB next to the SIM card. 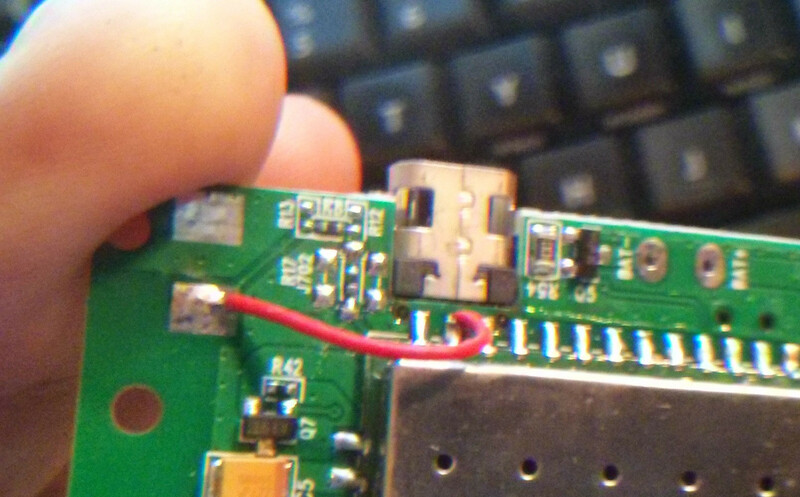 I think that’s a reset switch of some sort (although a bit odd that it’s a slide switch). For what it’s worth, I scanned the user manual. If you think that your car is at a reasonable risk of being stolen, then this is a pretty good idea. Fit it with a PAYG SIM from the kind of network provider that doesn’t charge you monthly for the pleasure of having a phone line and you’re done. If you have deep pockets, then you might want to get something a bit more fancy that probably has the same functions but gives you a warmer feeling about the build quality. Total investment: €28 with the Lebara SIM including €10 credit for SMS. Ping it every now and then for peace of mind – why not!? I wouldn’t rate this for real-time vehicle tracking (fleet management, usage-based insurance, etc.). SMS isn’t the ideal (neither security, nor cost nor connectivity) transport and the GPRS based interface is pretty much the same as the SMS interface. For real-time tracking you really want something that has a highly configurable reporting format (frequency and data items) that makes clever use of the circuit bandwidth and minimises total data traffic. 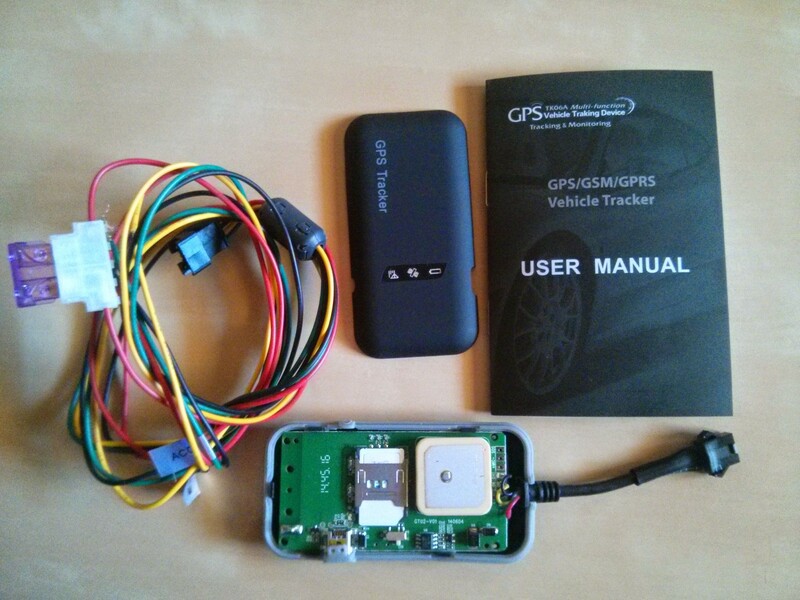 Previous Previous post: GPS Vehicle Tracker for €13?